THE DRAKON HESPERION (Hesperian Dragon) was a hundred-headed serpent named Ladon tasked with guarding the golden apples of the Hesperides and tormenting the heavens-bearing Titan Atlas. The creature was slain by Herakles when he was sent to recover the golden apples as one of his twelve labours. It was afterwards placed amongst the stars by the gods as the Constellation Draco encircling the north pole. In Hesiod, the parents and siblings of Ladon represent the various dangers of the sea. Therefore, the hundred-headed serpent, whose name means "Strong Flow", might have represented dangerous sea currents. "Keto (Ceto), joined in love with Phorkys (Phorcys), mothered the youngest of the deadly Drakones (Dragon-Serpents), that one who at the gloomy great hidden limits of the earth guards the all-golden apples[i.e. the Hesperian Drakon] ." "[Aiakos (Aeacus), the doorman of Haides, threatens Dionysos in the Underworld :] ‘The black hearted Stygian rock and the crag of Akheron (Acheron) dripping with gore can hold you; and the circling hounds of Kokytos (Cocytus) and the hundred-headed serpent (ekhidna) [i.e. the Hesperian Drakon] shall tear your entrails; your lungs will be attacked by the Myraina Tartesia (the Tartesian Eel) [Ekhidna (Echidna)], your kidneys bleeding with your very entrails the Gorgones Teithrasiai (Tithrasian Gorgons) will rip apart.’"
"An immortal serpent guarded them [the golden apples], the child of Typhon and Ekhidna (Echidna), with one hundred heads which spoke with voices of various types." 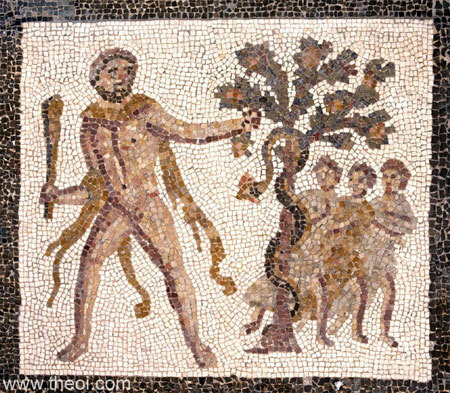 "Some say, however, that he [Herakles] did not take the apples from Atlas, but killed the snake that guarded them, and picked them himself." "As it were the branch of a river circles in wondrous way the [Constellation] Drakon (Draco, the Dragon), winding infinite around and about; on either side of his coil are borne along the Bears, that shun evermore the blue sea. Now towards the one he stretches the end of his tail, but with the coil he intercepts the Lesser Bear. The tip of his tail ends by the head of Helike (Helice), but in the coil Kynosoura (Cynosura) has her head. For his coil circles past her very head and comes near her feet, but again, turning back, runs upward. Not one lone star shines on his head, but on his brows are tow stars lit, and two in his eyes, and one beneath is set upon the chin-point of the dread monster. Aslant is his head, and he seems most like as if he were nodding to the tip of the tail of Helike; his mouth and right temple straight confront the end of her tail. That head wheels near where the limits of setting and rising blend." "[Wooden images dedicated at the sanctuary of Olympia :] The third of the treasuries . . . showing the heavens upheld by Atlas, and also Herakles and the apple-tree of the Hesperides, with the Drakon (Dragon) coiled round the apple-tree. These too are of cedar-wood, and are works of Theokles (Theocles), son of Hegylos. The inscription on the heavens says that his son helped him to make it. The Hesperides--they were removed by the Eleans--were even in my time in the Heraion (Heraeum, Temple of Hera); the treasury was made for the Epidamnians." "[The following is a late Greek rationalisation of the Hesperides myth, in which the drakon becomes a shepherd named Drakon, and the golden apples (mela) are instead a flock of golden sheep (mela) :] The last Labour which Herakles undertook was the bringing back of the golden apples of the Hesperides, and so he again sailed to Libya. With regard to these apples there is disagreement among the writers of myths, and some say that there were golden apples in certain gardens of the Hesperides in Libya, where they were guarded without ceasing by a most formidable Drakon, whereas others assert that the Hesperides possessed flocks of sheep which excelled in beauty and . . . the sheep had a peculiar colour like gold that they got this designation, and the Drakon (Dragon) was the name of the shepherd of the sheep, a man who excelled in strength of body and courage, who guarded the sheep and slew any who might dare try to carry them off. But with regards to such matters it will be every man's privilege to form such opinions as accord with his own belief. At any rate Herakles slew the guardian of the apples [Drakon]." 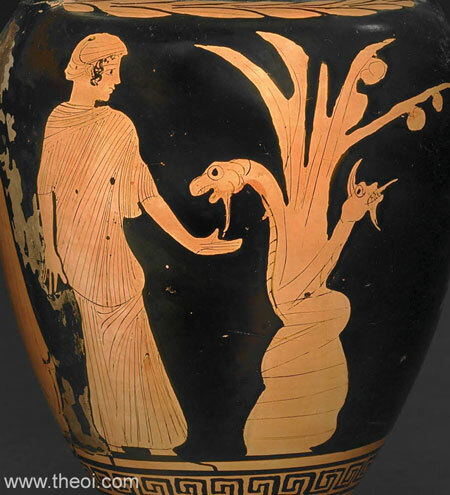 "[Depicted on the shield of Eurypylos, the son of Herakles :] There were the Golden Apples wrought, that gleamed in the Hesperides' garden undefiled : all round the fearful Drakon's (Dragon's) dead coils lay, and shrank the Maids [Hesperides] aghast from Zeus' bold son." "This creature [the drakon (dragon)] is said to be devoted to gold and whatever golden thing it sees it loves and cherishes; thus the fleece in Kolkhis (Colchis) and the apples of the Hesperides, since they seemed to be of gold, two drakones (dragon-serpents) that never slept guarded and claimed as their own." "Herakles has already secured the golden apples . . . and has won renown for his exploit among the Hesperides--to overcome them was not such an amazing feat for Herakles, but rather the drakon (dragon-serpent)." "The Drakon (Dragon) which guarded the golden apples was the brother of the Nemean lion." "From Typhon and Echidna [was born] . . . Hesperian Dragon (Draco Hesperidum)." "The huge Draco (Dragon), Typhon's son, which used to guard the golden apples of the Hesperides, he [Herakles] killed near Mount Atlas, and brought the apples to King Eurystheus." "From Typhon the giant and Echidna were born . . . the Draco which guarded the apples of the Hesperides across Oceanus." "Constellation Serpent. This huge serpent is pointed out as lying between the two Bears. He is said to have guarded the golden apples of the Hesperides, and after Hercules killed him, to have been put by Juno [Hera] among the stars, because at her instigation Hercules set out for him. He is considered the usual watchman of the Gardens of Juno. Pherecydes [C5th B.C. mythographer] says that when Jupiter [Zeus] wed Juno, Terra (Earth) [Gaia] came, bearing branches with golden applies, and Juno, in admiration, asked Terra to plant them in her gardens near distant Mount Atlas. When Atlas' daughters kept picking the apples from the trees, Juno is said to have placed this guardian there. Proof of this will be the form of Hercules above the dragon, as Eratosthenes [C3rd B.C. poet] shows, so that anyone may know that for this reason in particular it is called the Draco." "The Kneeler [constellation "Hercules"]. Eratosthenes [C3rd BC] says he is Hercules, placed above the Draco (Dragon) we have already mentioned, and prepared to fight, with his left hand holding his lion skin, and his right the club. He is trying to kill the dragon of the Hesperides, which, it is thought, never was overcome by sleep or closed its eyes, thus offering more proof it was placed there as a guard. Panyassis [Greek epic poet C5th B.C.] in the Heraclea says of the sign that Jupiter [Zeus], in admiration of their struggle, placed it among the stars; for the Draco has its head erect, and Hercules, resting on his right knee, tires to crush the right side of its head with his left foot. His right hand is up and striking, his left extended with the lion skin, and he appears to be fighting with all his strength." "The giant [Atlas] recalled the oracle which Themis Parnasia had given : ‘Atlas, a time shall come when from your tree the gold shall be despoiled, and of that spoil a son of Jove [Zeus] shall boast.’ In fear he had walled his orchards all around with massive ramparts and for guardian set an enormous Draco (Dragon); and drove off all strangers from the borders of his realm." "Your [Herakles] valour secured . . . the apples guarded by the Unsleeping Dragon (Draco Insomnis)." "Let him fetch the apples from the Dracon (Dragon) of the Hesperides." "[The labours of Herakles :] Next he essayed the rich grove's dwellings [of the Hesperides] and bore off the watchful dragon's golden spoil." "[The witch Medea casts a spell to summon poisonous snakes invoking the names of the greatest of the Drakones (Dragons) :] ‘Hither let that serpent [the Hesperian Dragon, constellation Draco] descend which lies like a vast rushing stream, whose huge folds the two beasts feel, the greater and the less . . . In answer to my incantations let Python come . . . Let Hydra return . 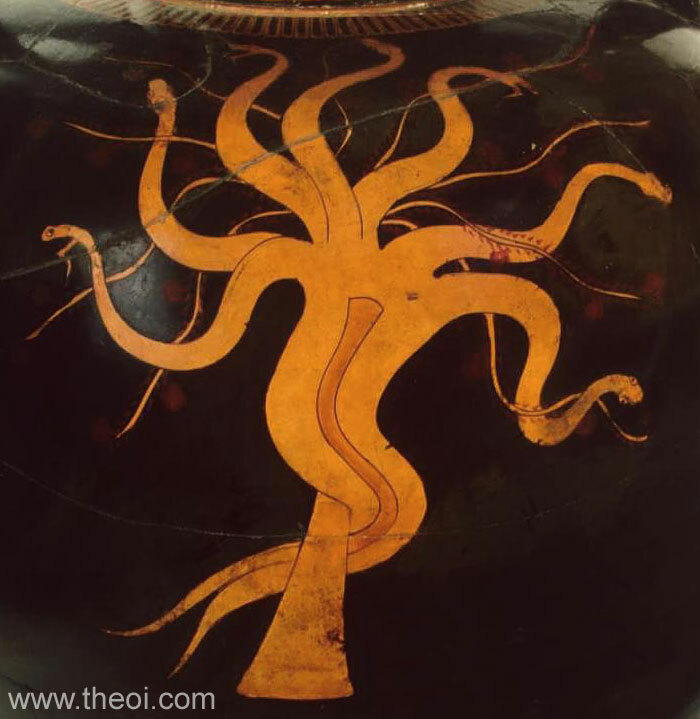 . . Thou, too, ever-watchful dragon [of the Golden Fleece].’"
Laconian Black Figure Vase Painting C6th B.C.